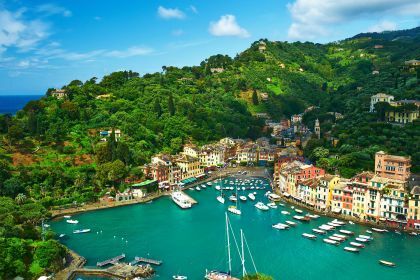 Call us or contact us here and an Abberley broker will make sure all the details are covered so you enjoy a perfect yachting experience in Portofino and the Italian Coast. From Monterosso al Mare in the Cinque Terra region, you will sail north to reach Portofino. The roll call of famous people who have visited Portofino over the past two centuries attest to its seductive charms. It includes Guy de Montpassant, the famous 19th-century French author, as well as German philosopher Nietzsche. Movie stars dazzled by its beauty and who often visited for its seclusion included Elizabeth Taylor, Richard Burton, Grace Kelly and Humphrey Bogart. Today you can spot the likes of musicians Rod Stewart, Beyoncé, Jay Z, Avril Levigne and Chad Kroeger, and actor George Clooney. Portofino seems to encapsulate that elusive quality of authentic glamour and elegance that is so fascinating and appealing. It oozes understated chic: think upmarket party venues, live bands, luxurious boutiques, and the best of traditional and gourmet restaurants. Taste mouth-wateringly fresh anchovies, pesto made of just-picked pine nuts, locally grown veal, fresh local herbs — the food offering in Portofino is out of this world. But before you tuck in, why not try a famed Bellini cocktail (a mixture of Prosecco sparkling wine and peach purée) on the terrace of the Hotel Splendido while delighting in the views of Portofino from above. It’s an absolute must when white peaches are in season. Ristorante Stella, the waterfront establishment serving some of the freshest seafood you will ever taste, is famous for its fish ravioli and plump mussels. For the non-fish eaters, there are plenty of other delectable dishes, made with homegrown produce, to sample. Their wines, desserts, service and ambience are truly world-class. Da u Batti, which is slightly off the beaten track, is the place to escape for some peace and quiet when the waterfront becomes congested in high season. Their Scampi a la Portofino with langoustines and giant prawns in their secret signature sauce are major drawcards. If you share the belief that the best restaurants to visit in a tourist hotspot are the ones frequented by locals, then Da u Batti is the place to go. You’ll see a lot of Italians here, though it’s unlikely you’ll be the only tourist in the restaurant. Da u Batti does have something of a cult following. The list of favourite Portofino restaurants would be incomplete without Tripoli: think sea view, pesto lasagna, fish skewers, pine nuts and anchovies… It’s a real feast for the eyes and the palate. 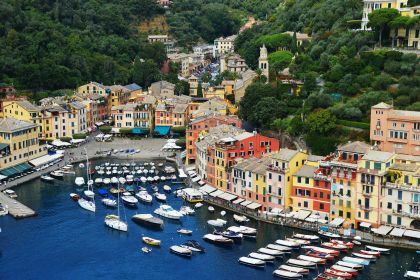 But Portofino is not just a catalogue of stunning views and foodie delights. Open-air picnics, natural wonders, bird watching and hiking are just a few of its other attractions. Did you know, for example, that it is located in the middle of a protected area, with abundant wildlife and lush vegetation? Portofino is a natural masterpiece. The mountains are spectacular, the air is clear and invigorating, the water is aquamarine, and the bougainvillea blooms are vibrant pink and purple… It truly is a slice of paradise. It offers rather unique attractions, too, such as the submerged statue of Christ, found 15m below the sea level. Christ of the Abyss is one of the major diving attractions in the area, as are its shipwrecks, fish and unique red corals. Scuba diving off Portofino not only leaves you awe-inspired but will overwhelm your senses. 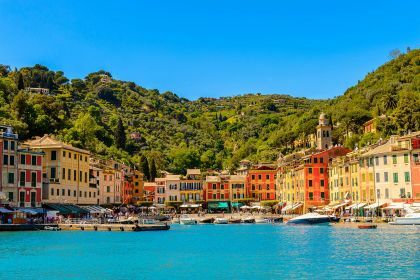 Call us or contact us here and an Abberley broker will make sure all the details are covered so you enjoy a perfect yachting experience in Portofino and on the Italian Coast.